JACKSON, Tenn. — Congressman David Kustoff paid a visit Friday to STEM class students at West Bemis Middle School. The students are participating in the stock market game Capitol Hill Challenge. Students can invest a pretend $100,000 in the stock market, bonds or whatever interests them. 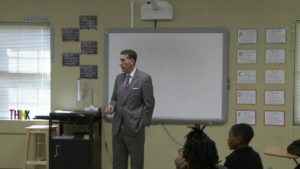 Assistant Principal Adam Peachey says the congressman’s visit shows the students that leaders want them to succeed. Leaders say the top performing schools in the Capitol Hill Challenge will have a chance to visit Washington, D.C.